Before stepping out on his own, Paris-based musician Etienne Jaumet was one half of Zombie Zombie, a formation offering a somewhat cheesy blend of Krautrock and horror movie soundtrack elements. Night Music fortunately forgets this unsavoury concoction almost entirely and focuses instead of ambitious settings and expansive soundscapes. The album is divided into five tracks, of which opening track For Falling Asleep is the centre piece. At twenty minute, this slow-moving progressive techno leviathan towers over the rest of the album but also establishes a particular aesthetic which cascades down, with various levels of success, into the remaining four tracks. As the album title suggests, Jaumet concentrates here on mid-tempo compositions destined for cerebral stimulation, and late night listening, rather than to fill the hottest dance floors around. This is where the Krautrock influences feed into the music. 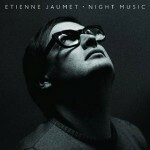 Throughout the whole record, Jaumet manipulates vintage, openly synthetic, psychedelic tones, over which he occasionally adds a sax or harp motif, the latter provided by Emmanuelle Parrenin, who also contributes discreet vocals on For Falling Asleep, and plays on the mind-expanding angle of his chosen sounds to create evocative platforms. This works particularly well on For Falling Asleep, which develops into a vast hypnotic narrative and goes through a number of phases over its course, or on closing piece At The Crack Of Dawn, a more ambient composition which could well act as an invitation to surrender to sleep and abandon oneself to dreams. Through The Strata also shows some interesting moments, especially as the main melodic theme eventually kicks in and develops into a series of swirling oriental patterns, while a beat sends regular shock waves in the background. The remaining two tracks, Mental Vortex and Entropy, reflect a more openly reverent atmospheric Detroit overtone. Unfortunately, Jaumet appears to cling on to a particular sound here, as if he was determined to recreate something that has been done countless times, and much more convincingly, in the past rather than focus on his own universe. This partly destroys the balance and genuine interest of the record as, while these two pieces remain fairly enjoyable, they lack both the ambitious and drive of the other three. Although Carl Craig’s touch, here occasionally reminiscent of his work as Innerzone Orchestra, can be felt throughout, he remains in the background, only adding touches to Etienne Jaumet’s tracks. Jaumet doesn’t need to play second fiddle on his own record and actually stands out fairly well on his own here. A tad of a hit and miss affair, Night Music fails to totally impress but when Jaumet lets go of constraints and allows his imagination to flow, this album becomes a convincing piece of 21st century music.